For a young person, it’s both an anxious and hopeful time. Not fully versed yet in the intricacies of how a culture or a society works or how government functions, the young person goes on an instinct which drives an intellectual curiosity that leads them to answers. I hear on the news how bad our economy is and how our military standing in the world is in decline. There is inflation, unemployment and talk of hard times ahead. What does this really mean? In the search for answers, I find there is a leader out there who is talking about getting government off our backs and reawakening our sense of self reliance and entrepreneurship. As a high school student, I am eager to listen to anyone who is talking about getting authority off my back, and love the frequency with which this leader uses the word freedom and other variations of the word free. Always misunderstood, the youth of America are looked upon as naive or ignorant. The more I'm told that the adult world is a functional place which requires me to behave myself, the more confused I become. The more I think about it, the more something doesn’t look right. I am beginning to question the adult world and in my own mind, I’m thinking its a bunch of bull. But what does a snot nosed kid know anyway? I was taught through a Catholic upbringing and through the values of my parents about this functional world where people could have fun and get a little crazy from time to time, but for the most part most (in my mind at least) it was supposed to be about operating with a moral compass, working hard, developing healthy relationships and eventually getting married and raising a family. I later find out that the adults gave it to me all wrong. They told me I'd be growing up into a world where people have to be moral, ethical, mentally focused, disciplined and be able to handle freedom with responsibility. Instead, when I open up the door and look outside into the adult world, it's nothing but people just getting by and a bunch of liberals running around with their moral relativism, antipathy toward prayer and religion and reckless ways of spending the public's money while running a "gangsta government." Even the culture is a mess. This isn't what I was told it would be like. All the thoughts in my mind were changing. My view of the world was becoming more reality based and less fantasy based. Ah, to be young. Young people like to rebel. To me, non-conformity meant being different than the norm. What I didn’t realize is that the norm was actually no longer the norm anymore. In so many people's quests for non-conformity, they have become the norm. The counter culture in essence has become the culture. Tie dye shirts, pink and purple hair, freaky rings in people’s faces became too status quo for me. The world was becoming a freak show until I realized, hey wait a minute, I'm the freak. I’m the one who thinks these crazy things about a functioning world where freedom comes with responsibility. I’m the one dressed funny in jeans and a polo shirt. I stick out like a sore thumb in a sea of tie dyeds and nose rings. Ah, but I have a major edge here. In a world of morally and ethically challenged morons, being what we used to call "normal" now automatically makes me a non-conformist. I'm the counter culture now. I would eventually go on to college and be told how wrong and crazy I was after embracing a political philosophy that doesn't match a dysfunctional world. Logic tells me it should work, but there are so many morons out there doing it a totally different way, I can't help but to wonder if I'm the one who's nuts. As people tell me I'm the loon, I begin to question my own sanity. Am I really the only one who gets it or am I really that far off base? Then one day my political science teacher in college gave us a research project. We were to pick one of the candidates in the upcoming presidential primaries. I picked the leader I was already following. Everyone was laughing. You picked that person? That person is an idiot, a moron. One student got so enraged that she threatened violence and wished that my leader was killed. The professor stopped her and corrected her by telling her that she should never say stuff like that about anyone even if she disagrees with them. All around me it seemed there were a lot of people who hated this leader. I knew I’d have to be strong. In studying this leader, I found that the leader gave a stunning speech at a Republican Party National Convention which matched every crazy thought I had in my head. I read what this leader was saying and watched this leader speak on television. One night, this leader gave a speech and I and was overwhelmed with an eye watering, warm sentimental feeling of “wow, this person gets the deal.” I’m really not crazy after all. I’m not alone. Finally, I thought, there is someone out there who believes exactly the same thing I do and who sees it the way I see it. Whoa, how’s that for validation of one’s world view? And this person is a person of influence with power, too. From that day forward, I would never doubt my sanity again. The uncertainty and angst I felt about my philosophy was replaced with a strength that I drew from my leader. I'd never be uncertain again. I studied it. I looked more into it. I made sure it was right. I was tired of reading the lies in the New York Times, so I started reading a wider range of other publications and learning about how conservatism works. Now, let me let you in something I didn’t tell you until now in this article. I’m 47 years old. That experience I just described happened over 25 years ago. If you're in your 20's or late teens, you may be experiencing something similar to what I wrote. You may have a leader that you look at the same way I looked at mine. But, you have not been where I have been. There is so much you haven't experienced yet. You never had the honor, the privilege and the most beautiful life experience of watching a great nation being led by a great leader. You never knew what it felt like to wake up every morning knowing that when you went to work things were only getting better with each passing day. You never knew what it was like to cry tears of joy as you watched this great leader on TV stand before the Statue of Liberty on the 4th of July and talk about how great America is and then watch as fireworks are blown off like they've never been blown off before. 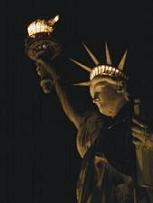 It was 1986 when the Statue of Liberty was restored. The statue was restored and so was our country. America really was a shining city on a hill. It really was a beautiful place. It was everything that people my age and older tell you it was. I have been to the shining city on a hill. I’ve seen it. I’ve lived it. I’ve experienced it. I weep every day when I see what’s happening to my country today. I watch videos of my leader’s speeches and can’t go more than five minutes without the waterworks going off. My leader was Ronald Reagan. Let me take something back here that I said earlier. I said you never experienced what I experienced. Let me correct that. You are now starting to experience first hand what I experienced. When I look out over the youth of America and I see kids who are the age I was when Ronald Reagan was coming into the presidency, I beam with an overwhelming sense of hope and optimism. I watch today’s youth struggle with the Obama years much the same way I struggled with the Carter years. I watch today’s youth experience an awakening much like mine was in the late 1970’s early 1980’s. Go study the Carter and Reagan years. You will be amazed at the striking the similarities are to how it is now. If you want to know what my leader was like, look at your leader. Know that your leader can be a part of a similar experience to what I had when my leader brought us home to morning in America. If it is going to happen again, the youth of today are going to have to fight harder than they ever have. They are the new hands that will write today's modern updated version of the American story. My leader was Ronald Reagan. Your leader is Sarah Palin. She needs your support. Your leader knows my leader. In fact, your leader is the same age as I am. Follow her. She knows how to get back to the shining city on a hill because, like me, she’s been there already. I can’t tell you what a thrill it will be to see it happen all over again through your youthful eyes.